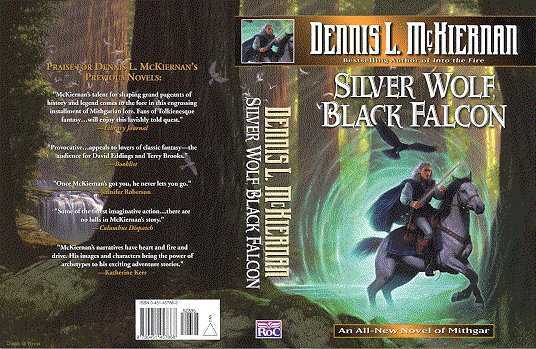 Foreword to "Silver Wolf, Black Falcon"
This is perhaps—perhaps—my last Mithgarian novel. Including this tale, I have written eight epics spread over twelve books, and one collection of Mithgarian stories . . . and there is one graphic novel based on the first story in that collection. All of these tales fit in an overall story arc, an arc which "historically" begins with The Dragonstone and progresses (in order) through, Voyage of the Fox Rider, the Hèl's Crucible duology, Dragondoom, Tales of Mithgar, The Iron Tower trilogy, The Silver Call duology, The Eye of the Hunter, and ends with Silver Wolf, Black Falcon. Oh, I didn't write them in that order, but "historically," that's where they fit into the arc. Hence, Silver Wolf, Black Falcon is the last tale in the arc, the last tale in the overall theme, the tail of the tale so to speak. If you are wondering what that overall theme might be, I'll tell you. In each of the stories I try to take up some central issue, idea, or philosophical or metaphysical question; oh, I'm not talking about good versus evil, the forces of light versus the forces of darkness as a theme, although such can be read into my stories. Yet as a theme, good versus evil is a bit too general. Instead I try to explore more specific issues which mankind has struggled with for millennia, issues such as: predestination versus free will; the nature of evil; the connections between events in terms of cause and effect, and whether or not all things are connected; the ability of the "common man" to rise to meet the challenge; the falsity of the romance of war; faith, reason, religion, and dogma; and man's effect on the environment: these are some of the issues involved in the Mithgarian mythos. I don't think I provide any concrete answers, but issues such as the above do provide much food for thought, things to ponder in idle moments (if nowhere else). The reason I interject these questions and ideas and philosophical or metaphysical inquiries into the tales—issues which the characters take up while journeying across Mithgar or while sitting in a comfortable setting—is to give the tale some substance. You see, a tale gets its energy from conflict and peril and challenge, but a story which is nothing but conflict—e.g., five hundred pages of continuous combat—although quite acceptable in some computer games, in stories gets old very fast. And so, although peril and conflict and challenge gives the tale its energy, it needs something else to give it substance . . . and, among other things, a tale gets its substance from the ideas embedded within. However, a tale with nothing but questions, philosophy, metaphysics, and issues quickly becomes a dry treatise, a dissertation, a thesis. The trick is to find the right balance between energy and substance. Oh, don't get me wrong, there's a lot more to a tale than conflict and peril and challenge . . . and ideas and issues and questions of a substantial nature: there's character, description, dialogue, special effects, a story to tell, and so on. And of course, all of these things need to be balanced, and I hope I've done a credible job. But I do believe that weaving issues into a story gives it an extra and worthwhile dimension, and perhaps you'll find the substance herein to your liking. Oops! I almost forgot: I promised to tell you of the overall issue in the entire arc of the Mithgarian tales. Is it good versus evil? The forces of light versus the forces of darkness? All of the above? Perhaps. Perhaps you'll see it that way. But for me, I don't think it's quite as grand an issue as that; for me it's a straightforward theme, though still a complex one: the common thread in the entire arc is the struggle of those who believe in liberty and freedom, in free will, in freedom of choice—in the freedom to control one's own destiny—against those who would take those things away, a struggle which in more ways than one continues unto this very day.